The Pro Wrestling League’s star quotient took take a massive hit after one of the Phogat sisters, who are in the limelight following a blockbuster biopic on their struggle, was on Sunday ruled out of the ongoing season. The much in demand real-life ‘Dangal’ girls—Geeta and Babita—were roped in by the Uttar Pradesh franchise, which also exploited the success of Aamir Khan-starrer Bollywood movie and chose to name their team ‘UP Dangal’ in PWL-2. However, in a statement issued late evening, UP Dangal team owners said Babita will be undergoing rehab after suffering an injury in the opening bout of the team, indicating that all was not well with her. “Babita suffered an injury in a comeback match vs Sofia Mattsson at the opening bout of UP Dangal and will undergo rehab for the injury suffered during that match,” UP Dangal said in a statement. Regarding Geeta, whose participation also remained doubtful, they sought to clarify that confirm that Geeta Phogat of UP Dangal team she will take part in the “subsequent matches” of ongoing Pro Wrestling League. Earlier, uncertainty hovered over the two star wrestlers’ particpation in the tournament. While some sources had claimed that Geeta was under the weather with high fever, others said that she was carrying some niggles. According to the Wrestling Federation of India (WFI), replacements were sought by the UP team for both Geeta and Babita. 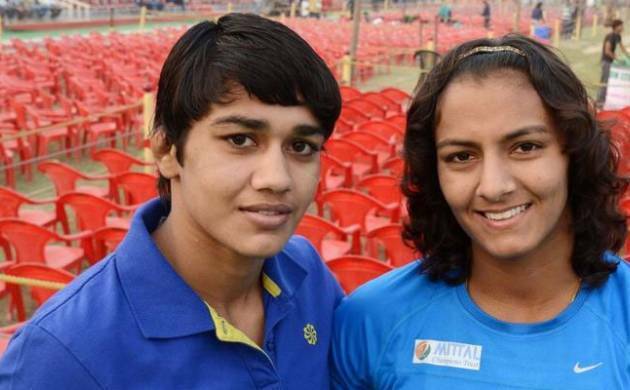 Pinki has been named as a replacement for Babita in women’s 53kg, while Manisha has been brought in place of Geeta in women’s 58kg. Another grappler Reshma Mane, who fights in a higher weight category, has been asked to reduce her weight to fit into 58kg, so that she could be an eventual replacement of Geeta as she is a better wrestler than Manisha. “Geeta and Babita are not pulling out of the tournament. They would be sticking with the team but in all probability would not take part in the competition further,” a top official in the WFI had told PTI earlier in the day. “In place of Babita, Pinki has been included in the UP Dangal squad, while Manisha has come in for Geeta for the time being but she is expected to eventually be replaced by Reshma Mane as UP team wanted her on the basis of her being a better grappler,” the source had added. In the match against Mumbai Maharathis last night, UP Dangal had fielded Manisha in place of Geeta in women’s 58kg as the veteran wrestler was down with high fever and had been advised by her doctor not to take part in the match. Manisha lost 1-9 to Mumbai’s Sarita.